Yesterday the Farmhouse received a phone call from our fellow community member, the Loon Center. Your camper has been practicing living in a community: their village. They live in close quarters and keep their belongings tidy, and tip toe past their friends who are sleeping when they wake up to use the bathroom early in the morning. Their village is part of the community that makes up Merrowvista and together we practice sharing the lauded 10 spots on the waterfront raft at “your time,” and taking turns washing the community’s dishes at “arlos,” and challenging each other to sing songs in the eating lodge. 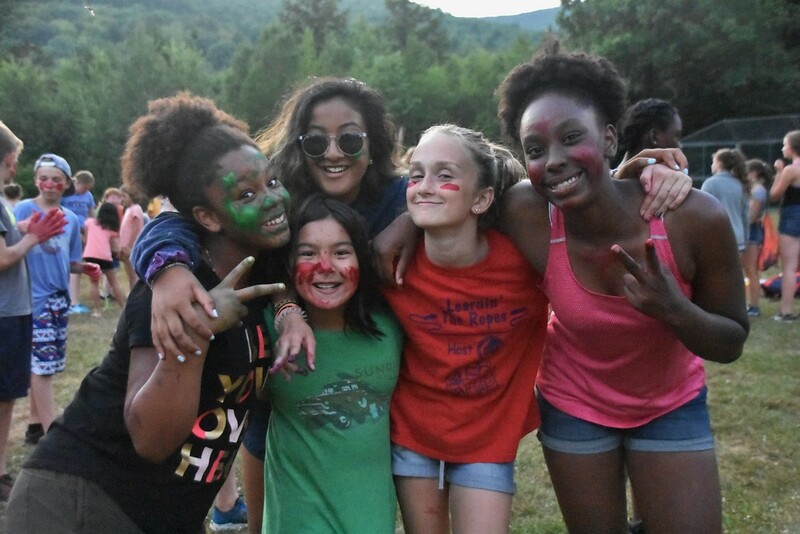 Just like your camper and their village, Merrowvista is practicing living in the community of Center Tuftonboro, NH. We try to be good neighbors and stewards of our beautiful home in the lakes region, and part of that means a friendly phone call from our friends down the road at the Loon Center. The Loon Center was calling to see if they could come to Dan Hole Pond this evening to capture and count the loons that nest on our waterfront and call to each other in their prehistoric laugh throughout the night. The Loon Center cares deeply about the sustainability of the loon population and we at Merrowvista do too, but we said no. On most other nights, our “Nights Doings” take place far away form the waterfront. Last night we watched MV Production in the Activity Center, a play written, staged, and performed by the 3 week Pioneer and Trailblazer campers. The night before that was Melbourne Cup, a contest of engenuity, spirit, and chutzpah that races Four Fold Tournament teams across the Activity Field in chariots fashioned from cardboard and duct tape. But tonight we gather at the waterfront for Candle Light Sing. It’s a very important night for us, a time of bittersweet reflection and serene celebration. This day was a day of endorphins! The Pioneer and Trailblazer campers traversed the entirety of the valley–from the top of the hill at the farmhouse, to the bottom of Dan Hole Pond, competing in the Four Fold Relay. There was a necklace making challenge, there was slips that needed sliding, there were arrows seeking bulls eyes on the archery range, and there was treasure in the form of colorful rings and wands to be retrieved from the bottom of Dan Hole Pond. Every camper had a role, and the final stretch of the race was worthy of an ESPN highlights reel, on the basis of the cheering squads alone. Meanwhile the Four Trails campers were sweating through the last leg of their trails. Ten of our eleven out-camping villages returned today from the various mountains, waterways, and back roads of New England. Their return culminated in the Voyageur and Odyssey walk in, when the entire community gathered at the Farmhouse to welcome our oldest campers back to the community. There was cheering, banner waving, song singing, and hugs, even when we were welcoming friends who smelled ripe from 3 weeks on trail. Of course, their celebration wasn’t complete until they ran down the hill and threw themselves jubilantly into Dan Hole Pond. Ours is a rather dynamic waterfront for loons to choose to roost, but just like campers return year after year to swim to birch point, compete in canoe sink-a-roo, and jump off the dock in their trail gear, the loons return year after year to raise their young. It’s true, candlelight sing is a quieter gathering. Each group chooses a song to share around the campfire with the rest of the camp community. We start the evening with rowdier numbers like Old King Cole and Sixties Party, but we transition to quieter melodies like On the Loose and the Fisherman song. I like to think the loons find magic in our joined voices the same way we do in theirs. Many groups choose songs that speak to the impact they’ve had on each other over these last three weeks. It’s amazing how close you can grow with someone when, together, you’ve overcome difficult challenges and made the most out of every day, golden or otherwise. It will be hard to say goodbye tomorrow. There will be tears as campers leave to return to their cabins, receiving their founder medal from Kris to serve as a reminder of all they accomplished at camp. We hope that the founder medal helps your camper remember that the gifts they discovered within themselves here are transferable to their community beyond this valley. That their community needs them and values them just as much as their village and the Merrowvista community needed and valued them here. It’s such an important night to the Merrowvista community, and it’s a terrible night to have Loon ornithologists mucking about along the shore line, decked in their waders and headlamps, looking for Loons. But, we’re trying to be good neighbors and part of that is learning to compromise and finding shared values in what may otherwise be competing priorities. We suggested that the Loon Center should come visit us and count the loons tomorrow night instead. Isn’t it wild to think that by tomorrow night our community will have dispersed across the country and the world? Our time together will come to a close, but we’ll each carry all the gems of summer learning that we’ve picked up during our time here at camp, camp songs, canoe skills, convictions in our abilities, we’ll bring it all home with us when we leave. To the ornithologist on the phone it seemed like a very reasonable ask, only 24 hours away. To us, it’s a bittersweet leap. We’ll bring this thing of magic–summer camp–to a close. We’re sad to say goodbye, but full of hope thinking of each community member returning to a new and distant community. It’s a win for us, it’s a win for the Loon Center, and a win for the community that gets to welcome your camper back home from camp.